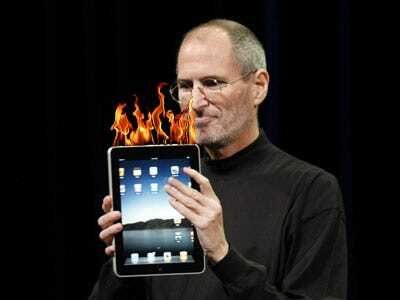 The Apple Investor: The iPad Is Finally (Almost) Here! The wait is almost over. And the stock is soaring as a result. The WiFi version of the iPad hits stores on April 3rd. The 3G version will hit in late April. You can book your pre-orders on March 12. The usual behaviour of stocks around events like this is to trade up in great anticipation and then sell off on the news. So enjoy the run. It will likely take absolutely blockbuster early sales to drive the stock higher once the iPad actually comes out. Apple dropped the price of the Mac Developer by 80% from $499 to just $99, indicating there was possibly lower enrollment than the company had targeted. Being more affordable will encourage developer participation, which leads to more applications encouraging more users and the cycle continues. More importantly, this is also an indication that the popular iPhone OS and the Mac OS X will coalesce at some point, bringing the company to one single platform again. The iPad runs the iPhone OS, which angered some critics because the device then wouldn’t be able to run a wide array of existing desktop applications. Convergence of the two operating systems would allow that to happen. It could also bring an incredible touchscreen capability to the Mac. It’s true, relatively speaking. While Adobe has been doing well over the past few years, an $18 billion market cap compared to Apple’s $190 billion market cap and $25 billion dollars in cash is chicken feed. More importantly, if Apple bought Adobe, Apple could take control of the Mac’s two most popular applications, Photoshop and Illustrator, not to mention fix the security issues with Flash that frustrate every iPhone user. While Steve Jobs did suggest at the shareholder meeting that acquisitions would consume some of Apple’s cash hoard, it’s not likely that Adobe was on that list of targets. The two companies have been drifting apart for the past five or so years, so the acquisition hypothesis is pretty far fetched. We also think the deal might have a tough time passing regulatory muster. For the third straight year and by the widest margin in history, Fortune Magazine has named Apple the “World’s Most Admired Company.” And, for three years, Apple has forced Google to take second place. This is respectable compared to the eleventh place Microsoft was awarded this year. While still an impressive standing, exclusion from the top 10 is likely to enrage Steve Ballmer. Fortune justifies the ranking by saying that Apple is the company that has changed the way we do everything on our computers, media players, etc. Apple also ranked first in Innovation among all companies. One warning: Rankings like these are often ominous signs for stocks: When companies are already perceived as No. 1, there’s nowhere left to go but down. According to the WSJ, Sony is building a PlayStation smartphone and other portable gadgets. While the move is not surprising, it just shows how far Sony has slipped behind its competitors. As Dan Frommer of Business Insider points out, in the mobile industry, Sony has been stuck relying on its Sony Ericsson joint venture, which hasn’t had a hit phone in years. And the Playstation Portable has lost significant mindshare since Apple’s iPhone App Store launched in 2008. Apple’s App Store has been huge for mobile gaming, especially on the inexpensive, touchscreen-equipped iPod touch. Sony’s only response has been the PSP Go, which has a similar app store and it’s virtually dead.